Delta - Portland Stone Ware Co., Inc.
DELTA® is a brand of Cosella-Dorken Products Inc. 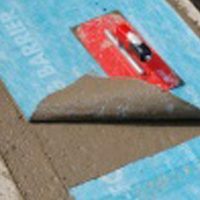 They strive to deliver innovative premium quality products to the North American construction market, after being a long time leader in the European building industry. DELTA® products have the longevity, quality, and technology that are desired in the building industry today. At Portland Stone Ware we are not just about supplying the heavy, rock-hard products, but we also seek out premier products that are innovative materials for the building/masonry industries and are complimentary to our other product lines. 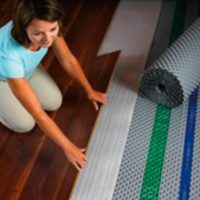 Click here for videos, installation guides, & more. 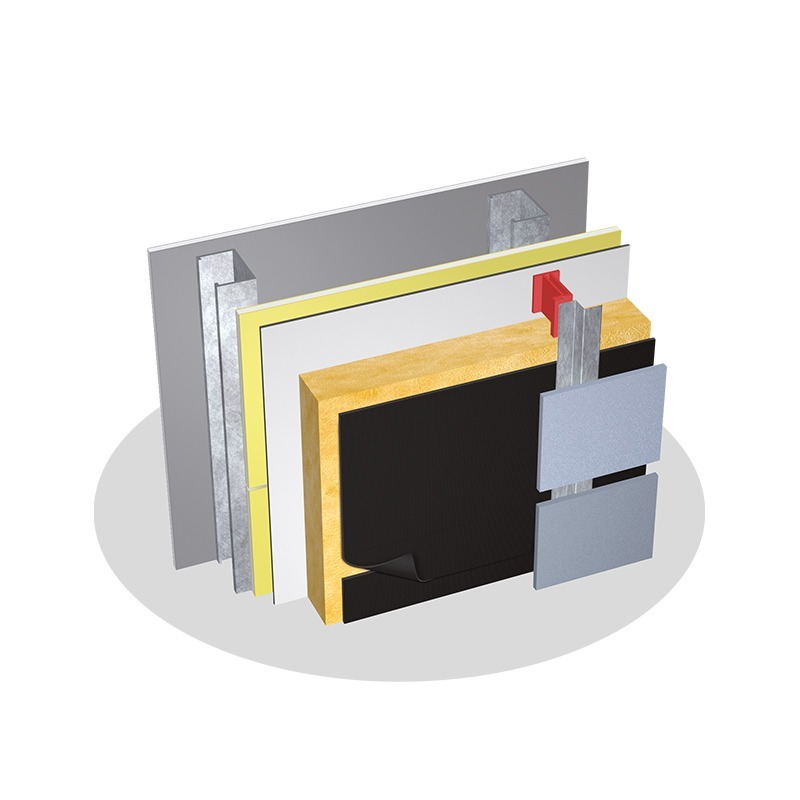 DELTA®-FASSADE S is the water-resistive barrier that is ideal for open cladding. 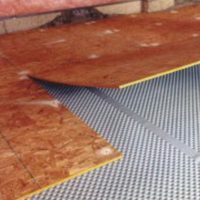 The watertight membrane is highly vapor permeable and extremely tear resistant. Highly stabilized against damage from UV exposure, the barrier is designed for use in cladding systems that have open joints up to 2” (50 mm) wide, which expose up to 40% of the entire façade surface. 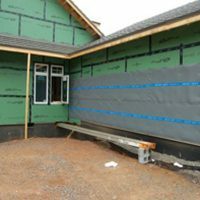 DELTA®-FASSADE S is the only UV-stable, water-resistive barrier that is tested under and has passed ICC-AC38. 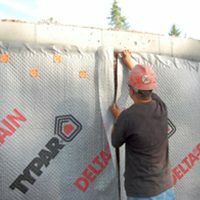 DELTA®-DRY Is a weather-resistive barrier & drainage membrane for residential & commercial construction. 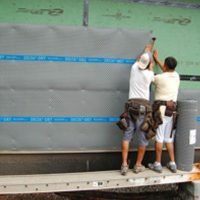 The Ventilated Rainscreen is an innovative approach of solving moisture problems in building wrappings. This is an ideal protection behind adhered absorptive claddings. 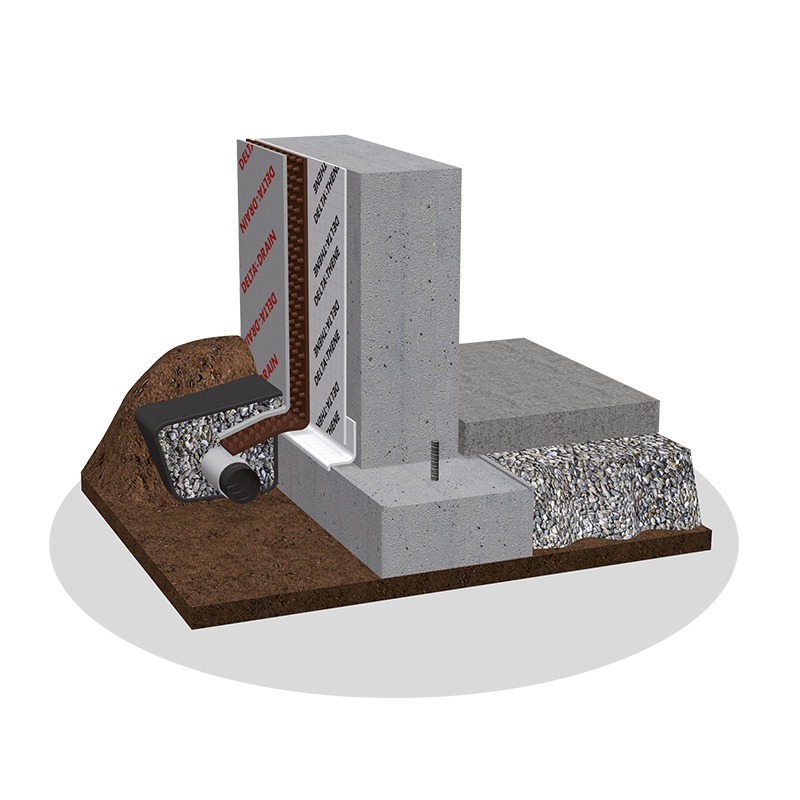 Proper ventilation is key for wall performance and the prevention of moisture accumulation. 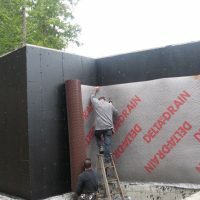 The structured membrane provides drainage and ventilation, as well as a complete capillary break behind the cladding. 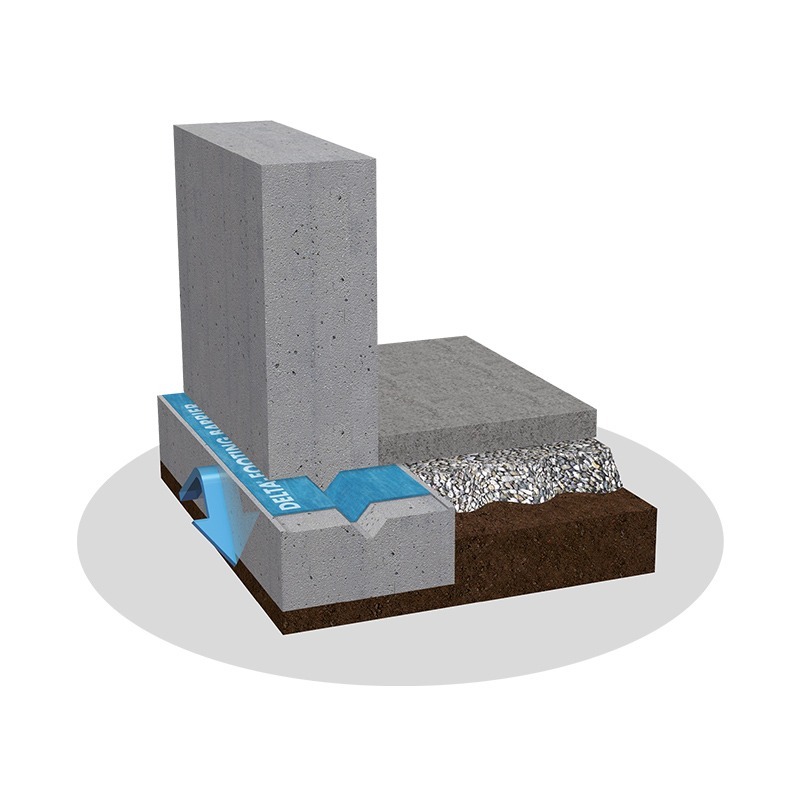 It protects the building envelope from bulk water intrusion (i.e. wind driven rain), and manages water leakage through the cladding. 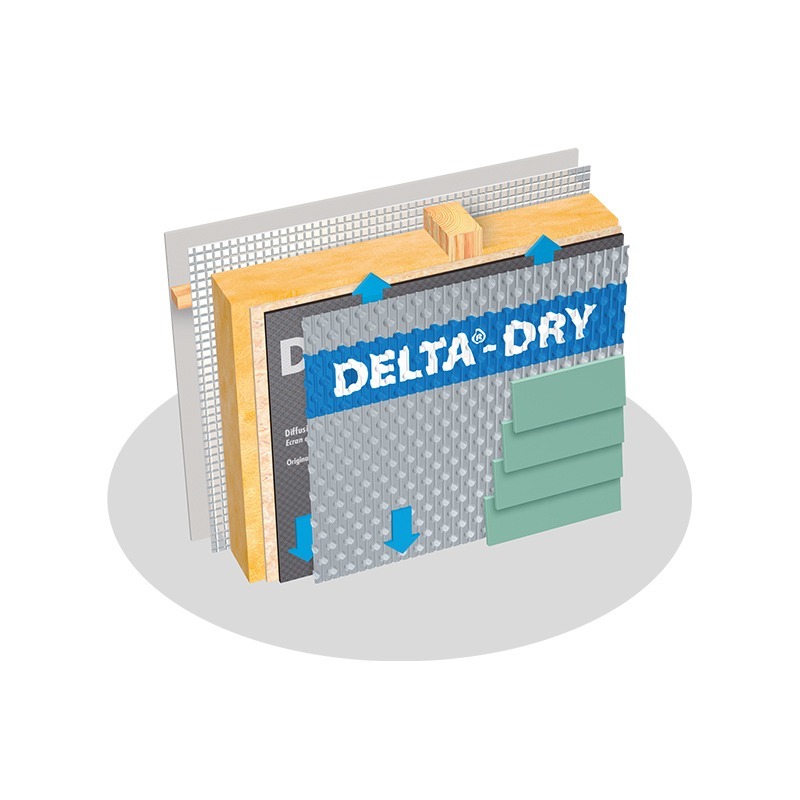 As well, DELTA®-DRY captures and drains transient moisture migrating through the wall structure. 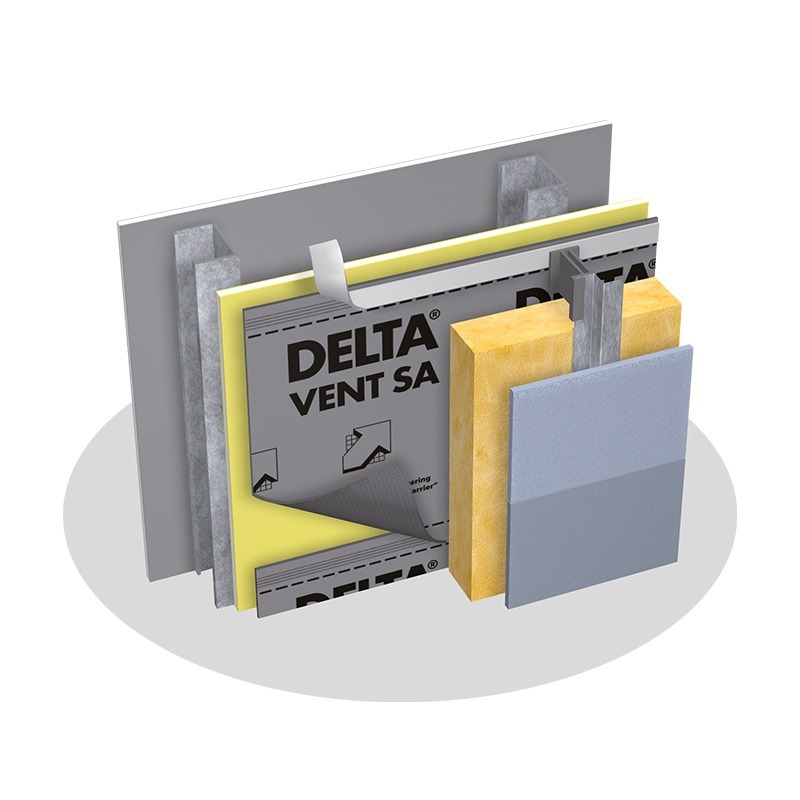 DELTA®-DRY provides an air-gap on the interior and exterior side of the membrane for drainage and ventilation. 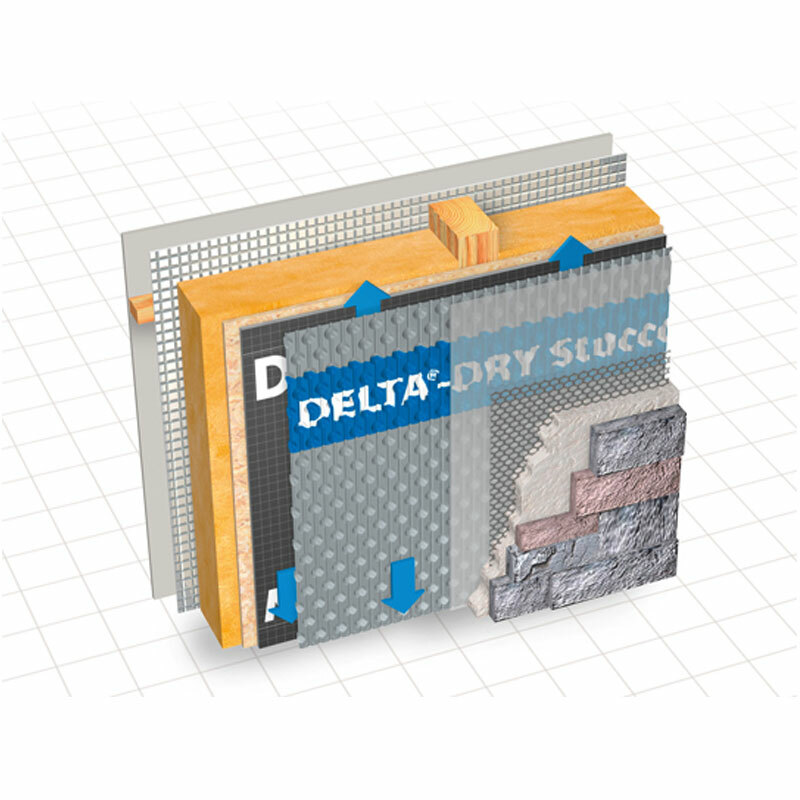 DELTA®-DRY STUCCO and STONE is also an innovative Ventilated Rainscreen very similar to Delta@-Dry only with a pre-installed mortar screen that prevents scratch coats from filling its dimple structure. 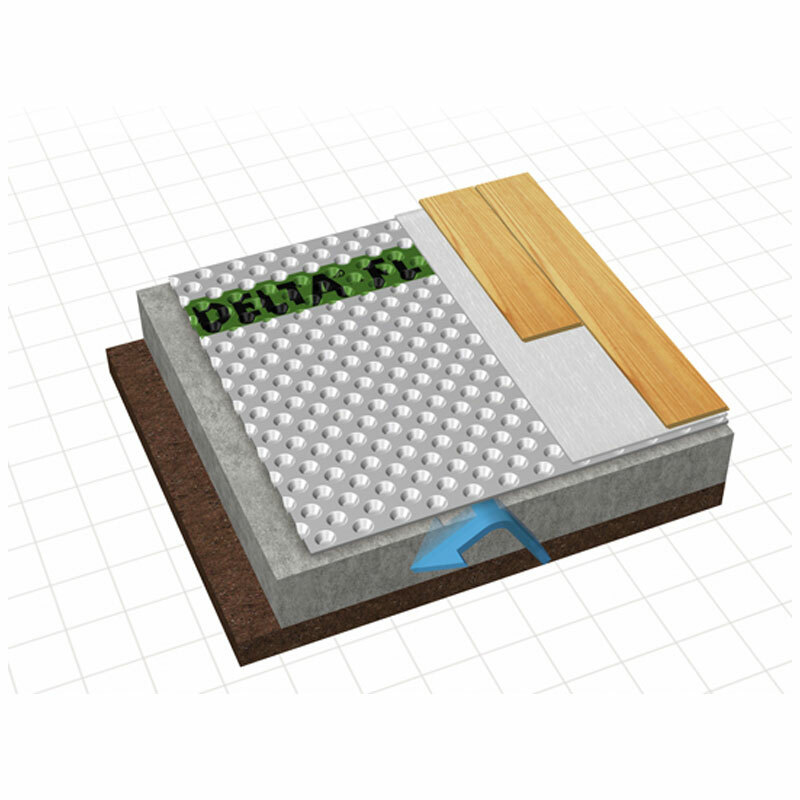 DELTA®-DRAIN is a highly effective drain board that controls the flow of below grade water. Its high water-flow capacity ensures effective drainage for virtually any construction project. 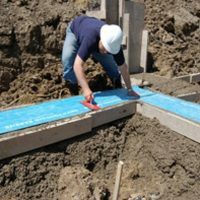 The drain board enhances the effectiveness of waterproofing because it relieves hydrostatic pressure build-up against subterranean surfaces. 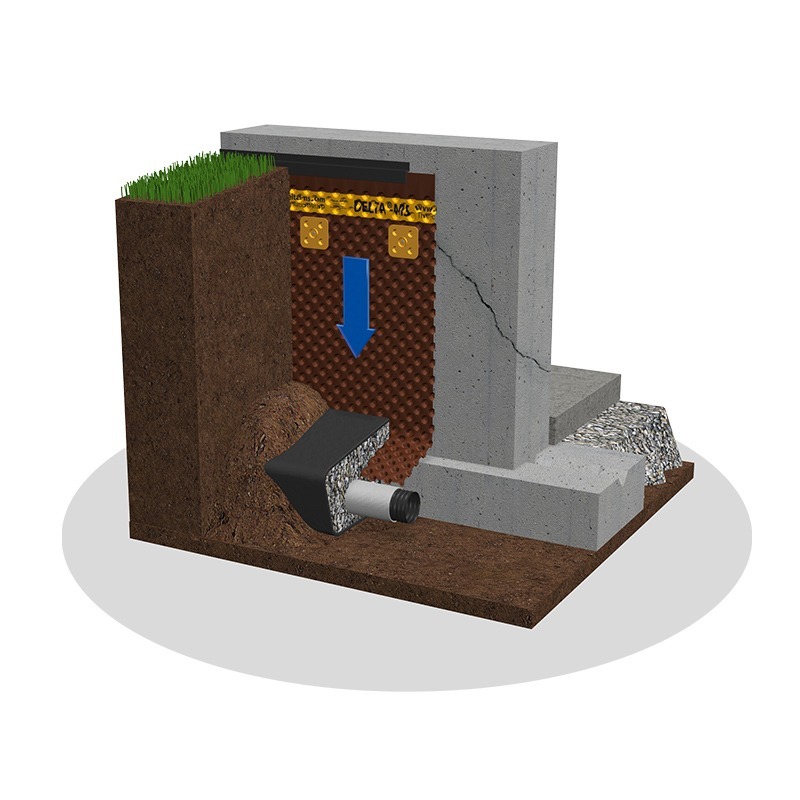 This product can be used for drainage in hillside construction, residential and light commercial foundations, ICF-foundations, wall drainage over waterproofing applications, retaining walls, etc. 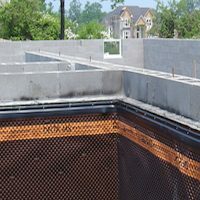 Capillary Barriers Moisture Protection is tough and pliable membrane that resists the capillary rise of water from footings into foundation walls. 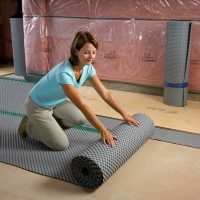 It helps to protect the basement from mold, deterioration of moisture sensitive materials and unhealthy living conditions. 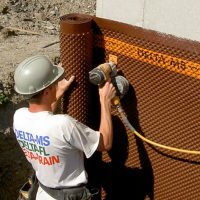 DELTA®-FOOTING BARRIER acts as a physical barrier, resisting the capillary wicking of water and upward migration of moisture from the footings into the foundation wall that is also known as rising damp. The material is designed to adhere well to the concrete footing. It is very pliable, allowing the forming of a keyway as per common practice.